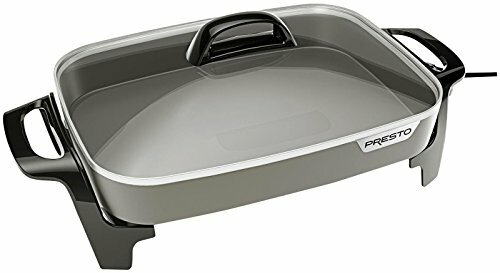 Roast, fry, grill, stew, bake, and make casseroles in this versatile Presto electric skillet. Ceramic nonstick surface, inside and out, assures stick-free cooking and easy cleaning. Jumbo 16-inch pan with high sidewalls provides extra cooking and serving Capacity. Great for every meal and entertaining! luxurious tempered glass cover with stay-cool handle allows the skillet to double as a handy buffet server. Maintain the desired cooking temperature automatically with the control master heat control. Saves energy too-it's more efficient to use than a range burner or oven! the heavy cast aluminum pan is virtually warp-proof. Skillet is fully immersible with the heat control removed. Manufacturer: National Presto Industries, Inc. Publisher: National Presto Industries, Inc. Studio: National Presto Industries, Inc.